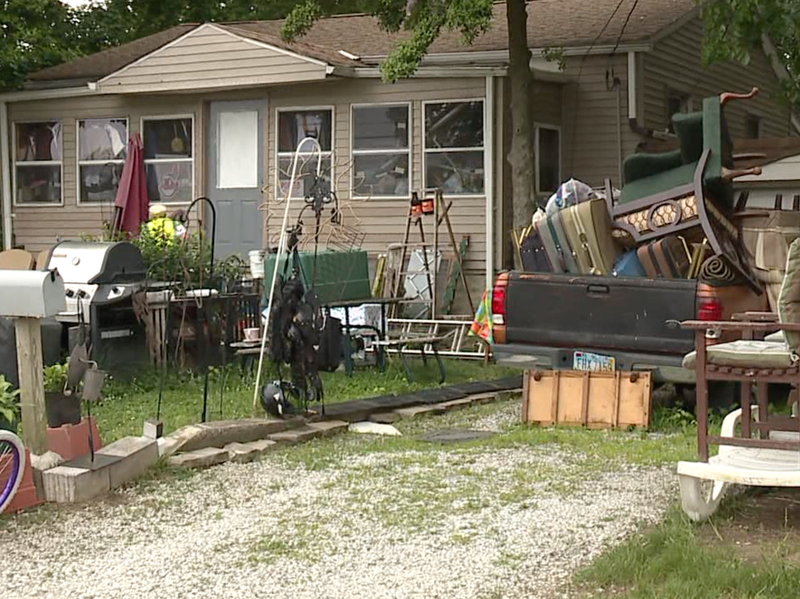 CLEVELAND, Ohio — Dozens of residents living along Grayton Road in Cleveland report they've been living with an illegal garage sale operating in their neighborhood since early 2017. A wide variety of items can been seen strewn across the front lawn of a home owned by Nancy Manning. Neighbors like Timothy Corrigan said they've reported the issue to the City of Cleveland numerous times, but so far the perpetual garage sale continues. "It's nothing nice to look at, it's just a pile of everything," Corrigan said. "You come home and it looks like a permanent garage sale. This is a nice neighborhood, you can see we have flowers, nice trees and that. Then you look over there, and you know they pulled the items out of the garbage." Cleveland Housing Court records indicate Manning has been issued multiple violations for her on-going garage sale since 2016. Manning was cited for trash and debris and is in violation of the city garage sale ordinance. Housing court records indicate there are now two warrants issued for Manning's arrest which carry a $6,000 bond, because Manning failed to appear in court. Corrigan and other neighbors said they are also concerned about Manning's customers who have to park and cross a busy Grayton Road to get to her outdoor store. "People park over here because there is no parking over there, and then they have to cross the street which is really busy," Corrigan said. "I've seen I don't know how many people almost get hit by cars, because they are trying to run across the street." News 5 contacted Ward 17 Cleveland Councilman Martin Keane, and city hall confirmed Keane is aware on the on-going situation. Manning refused to talk to WEWS television station reporters about the case. Meanwhile, residents are hoping they will finally get the resolution they have been fighting for. "If that's the way the city is run, well then something is wrong," Corrigan said. "They've got to speed it up a little bit."